Date Posted: Feb 21, 2008. I picked Clark’s designs to analyze because they follow the same basic concept I’m trying to aim for in creating my Typographic Timeline. I find the design to be highly creative in its format. Having the names and styles of various fonts creating an overall big picture or message through their arrangement is a concept I highly enjoy. One thing I like about the two designs is the readability and how it adds to the theme. Despite the size of the font, you can tell what Clark is trying to convey to viewers of the piece. For example, even though there are a lot of names of fonts not able to be read without a magnifying glass, you can still “read” them as being the name of a font written in that particular font style. Clark’s size treatment works well in aligning everything together. The way he can insert even more content within the counters/loops of various letters (IE: e, o, and g) written in bigger fonts works really well in the overall design. Plus, the way certain names go vertically, instead of horizontally, allows more creative components into making the design more complex. One thing I would do differently in the design is to make certain fonts in bold and italics to show off those styles instead of having to repeat certain names within my design. 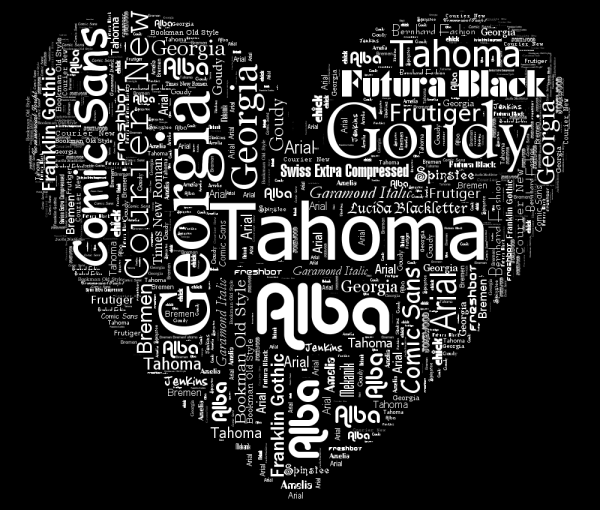 Instead of having 3 “Georgia” (written in regular style) font names appear in my creation I’d try to get rid of repetition by having “Georgia Bold” or “Italic Georgia” type deal to showcase various styles of the same font. I think Clark’s impact is greatest in the “Font Nerd” piece. The heart piece doesn’t really have the need to be created with the names of different font styles. 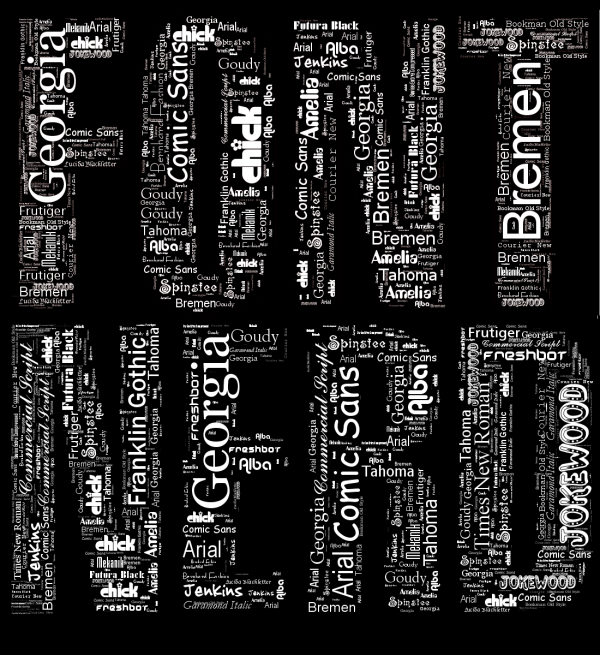 “Font Nerd” is perfect by being created through arranging font names. It creates the impact that the designer is in fact a nerd of font!